How Many Solar Panels Does it Take to Power a House? While many factors are involved in determining how many solar panels are needed to power your home, there is a basic formula. Gregg Garrison, general manager of Northeast Solar in Hatfield, MA, gave some guidelines for the average homeowner regarding the number of panels to power both electrical and hot water requirements. How many solar panels to supply an average household? Garrison stated that the typical home is approximately 1,500 square feet, with electrical costs of about $100 per month. Such a house generally needs about 16 panels to completely cover electrical power needs. What’s the difference between photovoltaic panels and solar thermal panels? The cells in photovoltaic panels generate electrical power by converting solar radiation (sunlight) into an electrical current. Photovoltaic (PV) cells are made of a variety of materials that include several types of silicon, arsenic and selenium. Solar thermal panels are a closed system of tubes that contain a solution similar to antifreeze. Solar thermal panels collect solar heat and transfer it to hot water tanks. Garrison advised that electrical hot water tanks work the best for solar hot water use. 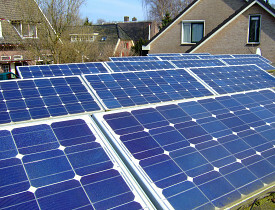 What affects the number of solar panels necessary to power your house? Depending on what direction your house is situated – north/south or east/west, you will have more or less sunshine available to you to convert into solar power. The other primary factor is how much shade your home receives. Contact a professional for an assessment of your home. They'll utilize technology such as a Solar Pathfinder to measure how much sun your home receives in a year, which in turn reveals how much power you could generate. They will also use a special device to measure shade and solar access. “Once we have gathered all the information, we download it into a program that gives us a more accurate measure of electrical savings and output,” disclosed Garrison. In general, for the average home (and 16 panels), it takes about six to eight years to pay back the cost of installation, according to Garrison. In addition, some power companies allow you to contract to sell excess power to be fed back into the general grid, saving you even more money over time. Solar panels have dropped in price considerably over the years. Seven years ago, the general cost of a 50-watt panel was $215, or $4.30 a watt. Nowadays, a 50-watt panel will run you $75, or $1.50 a watt. But the panels themselves are the most inexpensive part. The cost for the components of the solar system, like inverters, wiring, and mounts, can be $6,500 on average. You also need to factor in the fees for installation, permits, and inspections. The average homeowner will pay between $2,000 and $5,000 to install an appropriate solar panel system which includes permits and inspections. If your home is especially shady and you aren’t willing to take down the surrounding trees, it can take nearly double the time for payback. “Any shading on the roof reduces the amount of production,” Garrison warns. Currently, homeowners can take advantage of a variety of federal and state incentives to repay part of the system's cost. Federal incentives for solar energy have been extended through December 31, 2021, on a gradual step-down basis.